Fig. 16 Capital gearing. 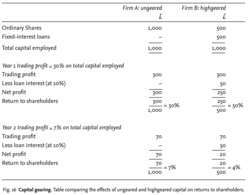 Table comparing the effects of ungeared and highgeared capital on returns to shareholders. the proportion of fixed-interest LOAN CAPITAL to share capital employed in financing a company. Where a company raises most of the funds required by issuing shares and uses very few fixed-interest loans it has a low capital gearing; where a company raises most of the funds needed from fixed-interest loans and few funds from SHAREHOLDERS it is highly geared. Capital gearing is important to company shareholders because fixed-interest charges on loans have the effect of gearing up or down the eventual residual return to shareholders from trading profits. When the trading return on total funds invested exceeds the interest rate on loans, any residual surplus accrues to shareholders, enhancing their return. On the other hand, when the average return on total funds invested is less than interest rates, then interest still has to be paid and this has the effect of reducing the residual return to shareholders. For example, compare two companies, one financed solely from share capital (ungeared) and another which raises half of its capital from fixed-interest loans on which it must pay 10% interest (highgeared). Fig. 16 (above) shows how returns to shareholders vary more widely when highgeared. The extent to which a company can employ fixed-interest capital as a source of long-term funds depends to a large extent upon the stability of its profits over time. For example, large retailing companies whose profits tend to vary little from year to year tend to be more highly geared than, say, mining companies whose profit record is more volatile. the proportion of fixed-interest LOAN CAPITAL to SHARE CAPITAL employed in financing a company. Where a company raises most of the funds that it requires by issuing shares and uses very few fixed-interest loans, it has a low capital gearing; where a company raises most of the funds that it needs from fixed-interest loans and few funds from SHAREHOLDERS, it is highly geared. Capital gearing is important to company shareholders because fixed-interest charges on loans have the effect of gearing up or down the eventual residual return to shareholders from trading profits. When the trading return on total funds invested exceeds the interest rate on loans, any residual surplus accrues to shareholders, enhancing their return. On the other hand, when the average return on total funds invested is less than interest rates, then interest still has to be paid, and this has the effect of reducing the residual return to shareholders. Thus, returns to shareholders vary more violently when highly geared.